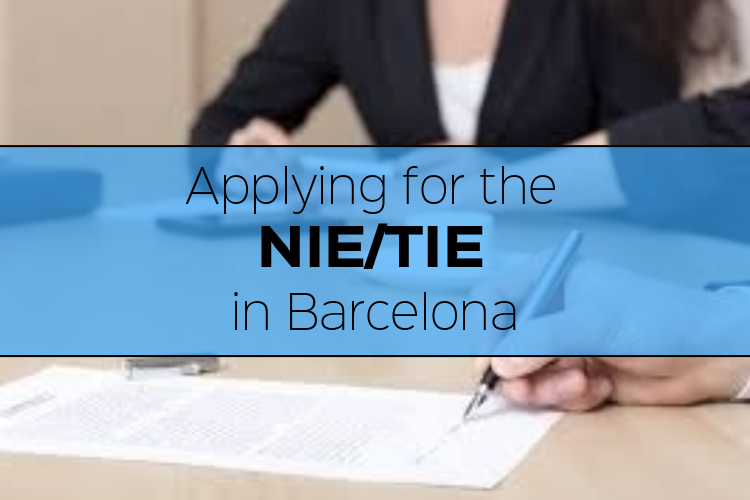 Before you get started with the process to apply for the NIE or TIE, please ensure that you understand exactly which documents you need to live, study and/or work legally in Spain! To do this, simply take a look at our main article and follow our lead! I. Make your appointment online by clicking here! Before you get to your appointment, you have to pay the designated 012 tax fee (model 790), which is 10,71 Euros (April 2018). Download the form here and complete it with your personal data. Click the section labelled “Certificado de registro de residente comunitario o Tarjeta de residencia de familiar de un ciudadano de la Unión“. Select to pay in cash (“en efectivo“) and leave the IBAN data empty. Finally, press “submit”, a PDF will be generated automatically and you will need to print out all its pages. Go to the nearest bank with the printed pages and pay the fee in cash. Please note: It is important to apply for your TIE during the first 30 days after entering Spain. Your student visa won’t always be sufficient to validate your stay in Spain. Also take a look at our blog about how to apply for a student visa. Before you get to your appointment, you have to pay the designated 012 tax fee (model 790), which is 15,60 Euros (April 2018). Download the form here and complete it with your personal data. Click the section labelled “Certificado de registro de residente comunitario o Tarjeta de residencia de familiar de un ciudadano de la Unión“. Select to pay in cash (“en efectivo“) and leave the IBAN data empty. Finally, press “submit”, a PDF will be generated automatically and you will need to print out all its pages. Go to the nearest bank with the printed pages and pay the fee in cash. Thank you so much. This is very helpful since a lot of Spain government’s websites are only in Spanish/Catalan. But, among the needed documents, what is “Copy of the granted administrative decision, in the case of initial authorizations”? This term refers to documents like a work or internship contract or acceptance letter from a school. Basically any administrative proof to justify why would will be in Barcelona/Spain for the next year! How do i fill in the form to pay for the tax without my NIE number? There should be another line on the form for you to put your passport number instead of the NIE number! I have been living in Girona, Spain for 5 months and my NIH/TIE is in process. If I travel to Italy now, will it be a problem since it will look like I’ve over extended my three month period on my passport? I am an American married to a British and who has his NIE and British passport. In short – You can’t travel with expired papers. You’ll need to apply for a document called the Autorizacion de Regreso, which allows you to exit and enter Spain ONCE while your TIE/NIE is renewing. I work for a uk company in the entertainment industry and am working in lanzarote until November. As I’m hired by a uk company they won’t accept my uk contract as sufficient evidence that I’m here for a valid reason. Is there any way I can get the NIE for people hired by companies outside of Spain but living here for more than 6 months? I received my TIE but they spelled my first name wrong. Any idea how to get it corrected? Hello, i am planning to relocate to barcelona, to study spanish and to explore the opportunity of startinga business there, but it is just an idea now as i would like to spend some time there to study the market first. I am italian, how can i apply for the NiE? If i have nothing to proof my reason to be there? I want the nie to be able to open a bank account and start my life there. Can i use my savings as a garantee? If so, is a bank statement enough? Did you move to Barcelona? if so how was the process? Hi there, I am a Canadian and would like to buy a car in Spain and travel around Europe for less than three months and sell it before I return. I understand I do need the NIE, can I get this as a tourist without any ambitions to study or work? If so, do you have any information regarding car insurance policies and the carta verde. Thanks! ¡Hola! ¿Qúe tema tengo que elegir para tener una cita de empadronamiento por primera vez? Baixa empadronament o Altres empadronament ? Hi! I am an EU citizen and have my NIE number but only on a piece of A4 paper. How do I get the green card with my details on? I’m trying to get an appointment for several days for the NIE number but it’s impossible, it’s always the same message, no available times at the moment. Do you maybe have any idea/suggestion how could I get an appointment? Or how often do they open new dates? He Barbara, I have the same problem. Did you solve it? What did you do? I arrived in Spain recently and I cannot find any available dates on the website. What do I do? This is some proof of work to study here. I.e an acceptance letter, a contract of work or internship etc. You get this from your school or place of work. I´m a fresh student in Barcelona with a visa for 3 months and in the process of getting the TIE. My question is does the TIE replace the student Visa? Or do i have to extend my student visa somewhere? I’m not working so I understand in order to get my NIE card I need to show proof of money in my bank. What kind of paper shall I ask the bank to provide for this? Also just a copy of my private insurance card will suffice? hi everyone. I am an non EU citizen, and living in spain already 3 months, soon my visa will be expired, but during this period I have married with spain citizen, and already have a cita with extranjeria for NIE on 30.08, which is overstaying my visa. any ideas what should be my next step? I have a hungurian visa which expires in feb.Now I am admitted in the university that is in spain. I am also in spain I just want to apply for TIE. At moment i just hv empadronament. Now tell me what can I do.